A visitor walks past the logo of Internet search engine giant Google. Italy's antitrust authority on Monday closed a probe into Google for alleged abuse of its market position, saying it accepted pledges made by the search engine to provide greater transparency. Italy's antitrust authority on Monday closed a probe into Google for alleged abuse of its market position, saying it accepted pledges made by the search engine to provide greater transparency. However, it also called on the government to review legislation to settle the question of sharing revenue gained from using copyright content, a key issue in the complaint by Italian newspapers. "The antitrust authority accepts Google's commitments" and "the investigation into possible abuse of dominant market position is closed," it said in a statement. 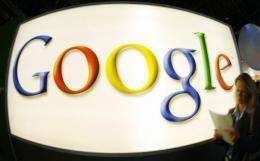 The probe followed a complaint by the Italian Federation of Newspaper publishers (FIEG) that Google was abusing its dominant position and failing to share advertising revenue with Italian newspapers. FIEG had originally said Google Italy obliged newspapers to allow their content to appear on the search engine's news site, where advertising generates income only for Google. Faced with a possible fine, in May 2010 Google had agreed to continue for three years its programme allowing allows publishers to opt out of Google News while leaving their content in Google search. The group had also pledged more transparency in its policy for sharing advertising revenue with newspaper publishers. In Monday's statement, the antitrust authority asked the Italian government to review copyright rules in order to avoid similar cases in the future. "An antitrust enquiry cannot sort out the issue of appropriate payment for businesses when their online editorial content is used by others," the authority said. "A national law is needed to specify a system of intellectual property rights to encourage conscientious cooperation on the Internet," it added. Google is also under investigation by prosecutors in Rome who have launched a probe into alleged invasion of privacy by the search engine's Street View mapping service. Google has defended the collection of personal data during filming for Street View as "accidental."